Unique Moments Photography from Gig Harbor Washington was Thrilled to be part of this awesome wedding at Chapel on Echo Bay, on Fox Island Washington. When we met Katie and she told us the location of the ceremony ,we were a little more than excited because Chapel on Echo Bay is about 5 minutes from our studio. This wedding was going to be right in the heart of Gig harbor and fox Island. Katie decided to get ready at her family home in Canterwood estates in Gig Harbor and Lance and the guys got ready at Lance and Katie’s new home. They did it old school all the way. The bride and groom did not see each other until Katie was escorted down the isle by her father. Its just could not have worked out better. We captured images of the girls after they were dressed and everyone headed for Chapel on Echo Bay. Katie and her father entered the church and Lance got his first look at a very stunning bride. The ceremony was ministered by Katie’s Grandfather, who, also married her parents 30+ years earlier. Everything was simply beautiful. The bride and grooms first gift as Husband and Wife was to share communion with their families, close friends, and guests. A kiss for luck and it was off to a spectacular reception catered by Snuffins catering from Gig harbor Washington. The dinner was absolutly amazing and the staff at Snuffins was off the charts excellent. First class all the way. Did we mention that the dinner was amazing. The reception festivities included speeches from the best man and maid of Honor and speeches by both parents. Katie and Lance had their first dance as husband and wife, followed by the father daughter dance and the Mom son dance. A cake was cut and guests and the bridal party danced the night away. Chapel on Echo bay is a beautiful venue. It sits right on the bay in Fox Island and the church has been in the community since the 1800’s. Everything about this location is beautiful. We cant wait to go back. The staff is friendly and helpful and the guest are always in awwww of the beautiful views over looking Puget sound and Fox Island. 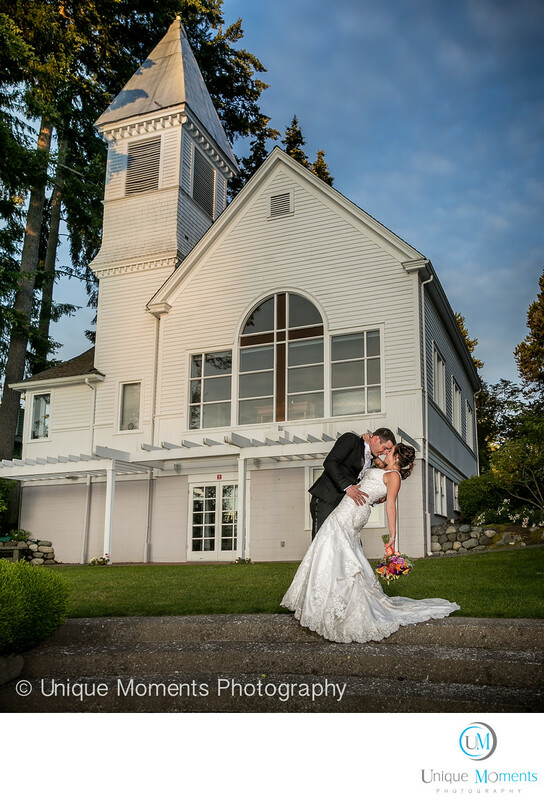 Chapel on Echo Bay is one of the best venues in the Gig Harbor and Fox Island areas and one we highly recommend. Location: 400 6th Ave Fi, Fox Island, WA 98333.